It seems our world is an increasingly stressful place – and the numbers of people suffering from mental health issues are increasing as a result. While the anxieties of studying are having adverse effects on teens, the pressures of the workplace are impacting adults. Mental health disorders cost the global economy $1 trillion in lost productivity a year, with depression being the leading cause of ill health and disability, according to the World Health Organization. More than 300 million people worldwide suffer from depression, an increase of more than 18% between 2005 and 2015. Meanwhile, 260 million people suffer from anxiety disorders. Many live with both conditions. 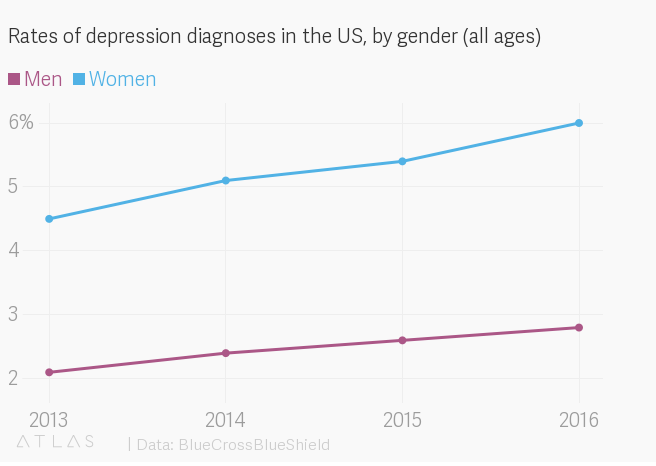 Diagnoses of major depression in the U.S. have risen by 33% since 2013, according to US insurer Blue Cross Blue Shield (BCBS). And this is rising even faster among millennials (up 47%) and adolescents (an increase of 47% for boys and 65% for girls). BCBS said major depression has a diagnosis rate of 4.4%, affecting more than 9 million commercially insured Americans. Women are twice as likely as men to be diagnosed with mental illness (6% versus 3%). People with major depression use healthcare services more than other commercially insured Americans. They also have more than double the usual healthcare costs ($10,673 compared to $4,283). Much of the blame for depression and poor mental health is based on the experiences employees have in US workplaces, according to a 2017 Mental Health America (MHA) study of 17,000 employees across 19 industries. A lack of employer support, MHA says, contributes to higher levels of workplace stress and isolation. These factors strongly correlated with job dissatisfaction: 33% of respondents reporting high absenteeism rates. Meanwhile, 81% of respondents reported work-family conflicts and 63% suffered increased mental health and behavioural problems. Despite the number of sufferers globally, there is still a lot of stigma attached to discussing mental health in the workplace. In the US, the 1990 Americans with Disabilities Act prohibits discrimination against individuals with disabilities and mental health issues in all areas of public life, including jobs and education. In the UK, the Equality Act 2010 performs much the same function, but the efficacy of such rules is questionable. For example, a 2017 study found that up to 300,000 Britons lose their jobs each year because of mental illnesses, while about 15% of workers have symptoms of existing mental health conditions. The estimated losses to the economy range from £74 billion to £99 billion a year. The report, commissioned by Prime Minister Theresa May, recommended that businesses produce, implement and communicate a mental health at work plan, encourage open conversations about the topic and provide support when employees are struggling. In a move that will chime with respondents to the US MHA survey, the UK report also says companies should provide good working conditions, effective line management and ensure staff have a healthy work-life balance as well as opportunities for development.